The half-up top-knot has been my go-to this summer, especially since we're caught in a heatwave with high levels of humidity and zero chance of preventing frizz. Achieving this top-knot bun involves a lot of trial and error, especially depending on the state of your hair (curls, frizz, etc). Here are a few tips that will help you tame the mane and sport the hairstyle everyone's rocking this Summer. This guide is best suitable for those with wavy hair like myself. 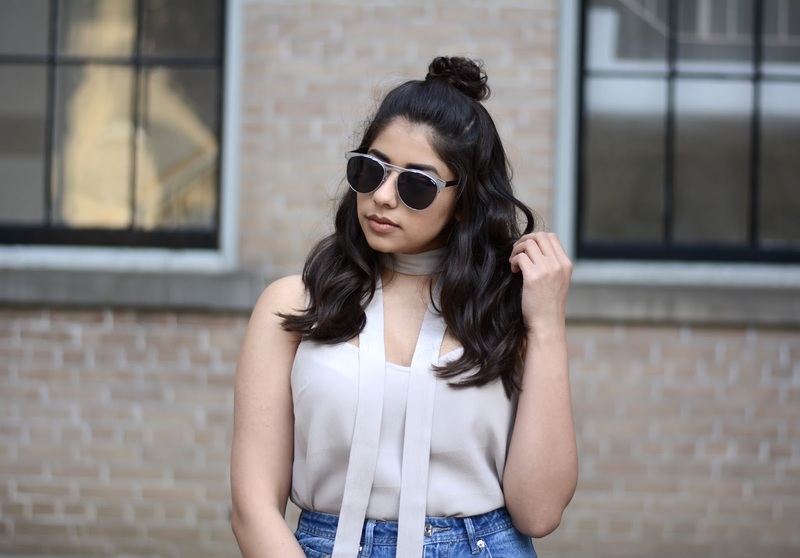 The messy top-knot also works well with straight hair, although these steps are not meant for other hair types. Polybands are mini hair elastics that you can pick up at your local drug store or beauty boutique. They're extremely small and elastic making them nearly invisible in your hair. They also come in various shades to suit your hair colour (black, brow, clear, etc) Unlike with your standard hair tie, this hair style allows the use of as many polybands as you require to lock down that bun. The goal here is to create effortless beach waves, especially if your hair is on the shorter side. A standard curling wand works best, I use a 25mm wand. Curl some waves into your hair before tying it up to add volume to your bun. Once the bun is in place, style in the rest of the waves. Apply a small amount of serum or hair oil to your waves to add shine, prevent frizz and hold in the waves. Try to avoid using hair spray because you don't want to set your hair in the highly likely event that it comes undone and you're left with a birds nest of a mess. Instead, apply small amounts of serum throughout the day to maintain frizz.